How Can I Export Quiz Taker Data Directly From LeadQuizzes? 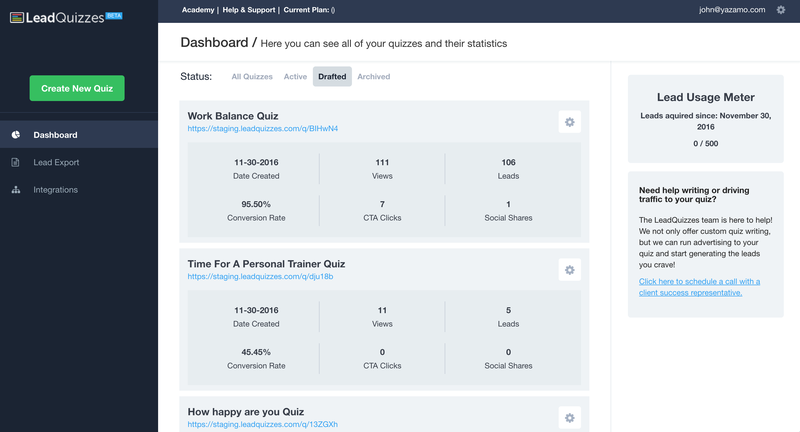 To export leads from a quiz first navigate to your quiz dashboard. This will redirect you to the lead exports page where your export will begin processing. The page will automatically refresh and an email will be sent when the CSV is ready to download. When the status of your export changes to Ready you can click Download to get a CSV copy of your leads for that quiz. The export records available on the Lead Export dashboard consist of leads exported up until the date shown for the record. This means that any leads captured after this date will NOT be included in the CSV. If you want the most up to date record of leads captured for a quiz then you must export a new lead record.